Montuno welcomes Eric Bibb & Habib Koité to our Spanish Booking Agency. 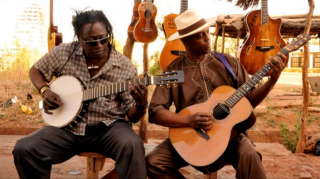 American singer/guitarist Eric Bibb and West African singer/guitarist Habib Koité have come together for Brothers in Bamako. It is an exciting gumbo of the two artists’ influences of blues, folk, gospel and world music. Habib and Eric first met 10 years ago, when both were invited to play on the album Mali to Memphis (Putumayo). They struck a chord, exchanged a few notes, then a few songs. A connection was established, friendship followed. Both recognized that blues has its roots in Africa. The dialogue continued and a follow-up meeting launched the project that would become Brothers in Bamako. Learn more here.